Earth: Everlasting Summer - Beautiful triptych illustrating a scene from the famous "Tale of Genji." 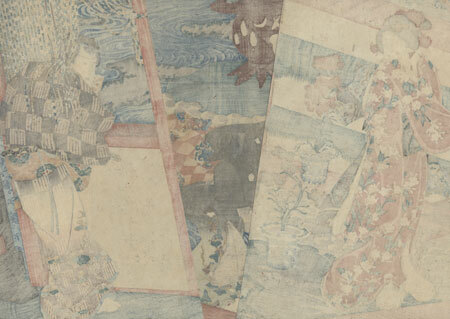 At right, the young Prince Genji leans out of a window hung with a beaded curtain at right, admiring a view of the beauties working in the courtyard garden. In the center, a beauty looks up with a blossoming potted plant in her hands, smiling back at the grinning nobleman. The flowers are pinks, which are known in Japanese as "tokonatsu" or "everlasting summer." At left, her companion giggles behind the sleeve of her kimono as she watches. A flowing stream winds through the garden, past a lamp with a scene of a deer, pine trees, and moon, and a locust sitting on top of it. 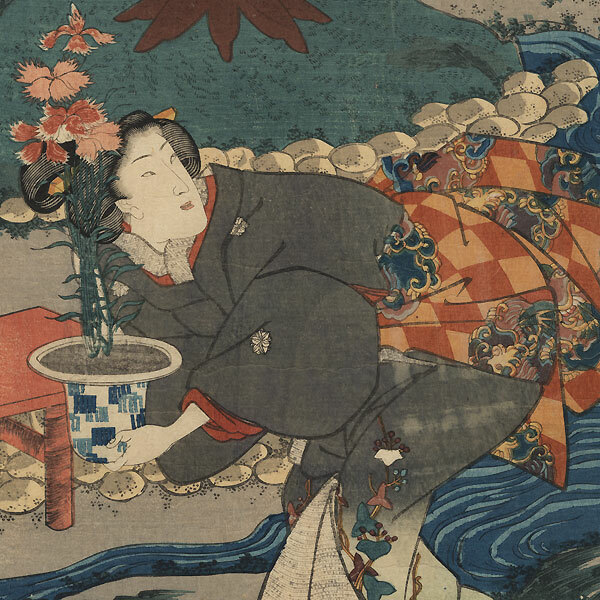 At far right, the chest or screen beside Genji features an unusual image of a western woman playing a flute. She wears a bustled dress and an ornate hat with a stuffed bird perched on top. A lovely design with a beautifully detailed setting and fine line work. A lovely design with wonderful detail. Image Size - 14 1/4" x 29 5/8"
Condition - This print with excellent detail as shown. Three separate panel, partially backed with paper. Slight toning and soiling, a few crease and stains, slight paper remnant at right edge. Please see photos for details. Good overall.